Here are two articles,one covering our sister Priests in Philadelphia,and one in Washington DC for the POPE’S visit. Juanita Cordero of San Jose, Suzanne Thiel of Portland, Ore., and Penny Donovan of Los Gatos, Calif., call for the ordination of women while outside the World Meeting of Families in Philadelphia. 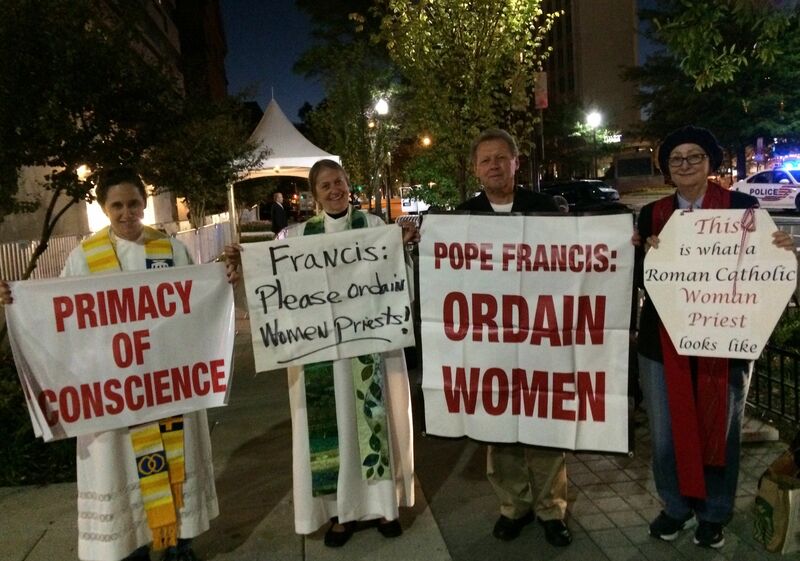 The passing crowd’s responses to the banner outside the World Meeting of Families and the women in priest’s collars holding it ranged from revulsion and anger to confusion and praise. “That’s just wrong!” another woman muttered. Of all the controversial issues awaiting Pope Francis here, from contraception to divorcees and gays, one of the most polarizing is the push to ordain female priests. Groups that still identify themselves as Catholic have been ordaining women in unsanctioned ceremonies. They argue it’s time the church embrace what they’ve already been quietly doing for years, with the latest ordination scheduled at a Quaker retreat here Thursday. Some of those passing the banner stopped to ask questions. Others flashed a thumbs up, pumped their fists in support and posed for selfies with the group. “This morning it was very, very negative — this priest just gave a dismissive wave like he could make us disappear,” said Eileen DiFranco, 63, of Philadelphia, one of a half dozen local female priests who was wearing her collar Wednesday. “You’ll change everything,” one passer by complained. “Things need to be changed,” DiFranco said. Ronald Savage, 82, of nearby Collegeville, Pa., was affable, but opposed. Penny Donovan, a deacon from Los Gatos, Calif., studying for the priesthood, tried to laugh it off. “You have strong opinions!” she told one woman. Pope Francis has said that when it comes to female priests, “the door is closed.” But supporters at this week’s protests here were still hopeful. In a recent Pew Research Center poll, 59% of Catholics think the church should ordain female priests, but only 41% expect the church to allow it. Women and young Catholics are even more skeptical. Only 37% of women and 35% of Catholics ages 18 to 29 say the church will someday ordain women. Merylee Shelton, a San Jose-based Women’s Ordination Conference board member, noted that more than 150 women have been ordained so far, although the church refuses to acknowledge them. She compared it to the Mormon Church’s initial refusal to accept or promote black members into their leadership. “Citizens have to remind the pope in particular that he’s in the United States, the birthplace of democracy. We need to remind him that the church is functioning outside of democracy,” Shelton said. Some were hopeful the church will ordain women within their lifetimes. “There’s always the opportunity to change,” said Roy Bourgeois, a peace activist and former priest excommunicated three years ago after 40 years of service for ordaining a woman at an unauthorized ceremony in Kentucky. That’s why they brought their banner to the downtown convention center. “Our intention is to be visible, to let people know we exist,” said Juanita Cordero of San Jose, a former nun ordained at an unsanctioned ceremony. On Wednesday and the day before, she wore her priest’s collar while toting the banner and distributing prayer cards with intentions for female priests. Cordero said she was called to be a priest, to lead a church and administer the sacraments. This week, she focused her outreach on passing clergy, especially leaders. She was surprised that organizers of the event allowed them to stay — they have been asked to leave other gatherings. Cordero was more amazed when Cardinal Kelvin Felix from the Caribbean accepted a prayer card and gave her his blessing. Then a priest from Calgary, Canada, stood with her in solidarity. A bishop approached, and Cordero handed him a card. He took it. 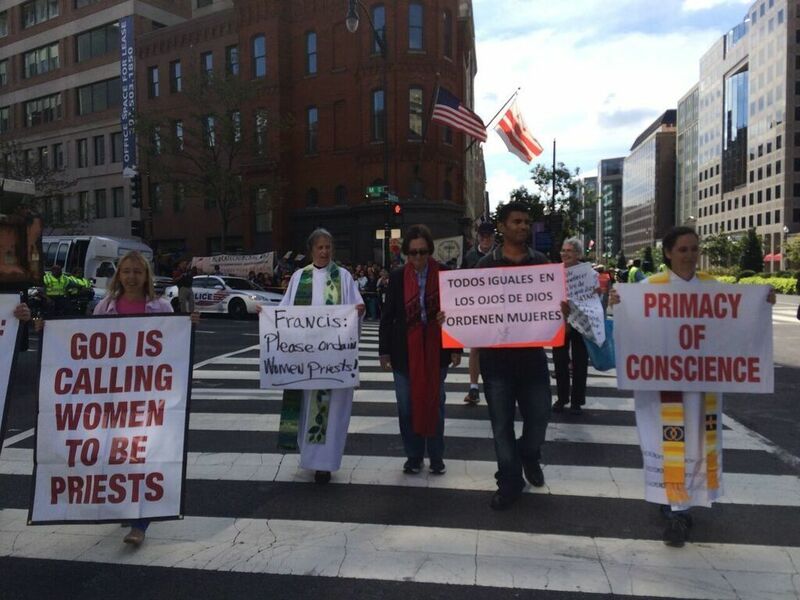 WASHINGTON — Seven people who say they are ordained Catholic priests protested the church ban on women in the priesthood Wednesday outside St. Matthew’s Cathedral, where Pope Francis met with U.S. bishops. Four of the protesters were women. The demonstrators, all members of the Roman Catholic Women Priests, staged a “die-in” — a protest tactic where participants lie down and force police or security to remove them — capitalizing on the attention surrounding the pope’s visit. All were later arrested and issued $50 tickets. The organization has ordained 215 women worldwide since its 2002 founding, even though the Roman Catholic Church doesn’t recognize women clergy. Representatives of the nonprofitWomen’s Ordination Conference attended the rally in support of the protesters. Both groups want the pope to repeal canon law 1024, which states that only men can be ordained as priests. Priests at Wednesday’s protest include those with backgrounds in social activism and civil disobedience. Several have served time in federal prison for protesting issues like drones and nuclear proliferation. As protest veterans, the priests knew the right location would be crucial for their demonstration. They arrived in front of the cathedral at 5:30 a.m., before sunrise. Sister Janice Sevre-Duszynska, a Kentucky native ordained by the Roman Catholic Women Priests and one of the leaders of the protest, voiced frustration at what she said was a great injustice. “This is an act of violence, denying priesthood to women,” she told The Huffington Post. “I think folks are forgetting that Pope Francis is the CEO of an institution that’s a patriarchy,”said the Rev. Roy Bourgeois, another leader of Wednesday’s protest. Bourgeois grew up in Louisiana in the 1950s and likens the treatment of women in the church to black parishioners being confined to the back five pews of his childhood church. “Sexism, like racism, is a sin,” he said. After Bourgeois attended Sevre-Duszynska’s ordination in 2008, he said he received a letter from the Vatican demanding he recant his support for the ordination of women or face excommunication. He was expelled from the priesthood in 2012. As the sky began to grow light Wednesday morning, a security guard ushered the protestors away from the church onto a nearby corner, where they remained for several hours. A stream of fans and devoted worshippers arrived later in the morning to herald the pope’s arrival. Some expressed disapproval for the women priests’ cause. “There’s no such thing!” one woman said when she heard the name “Roman Catholic Women Priests.” As the protesters and their supporters marched along the street, a rival conservative group bearing loudspeakers attempted to drown out their acoustic guitar. 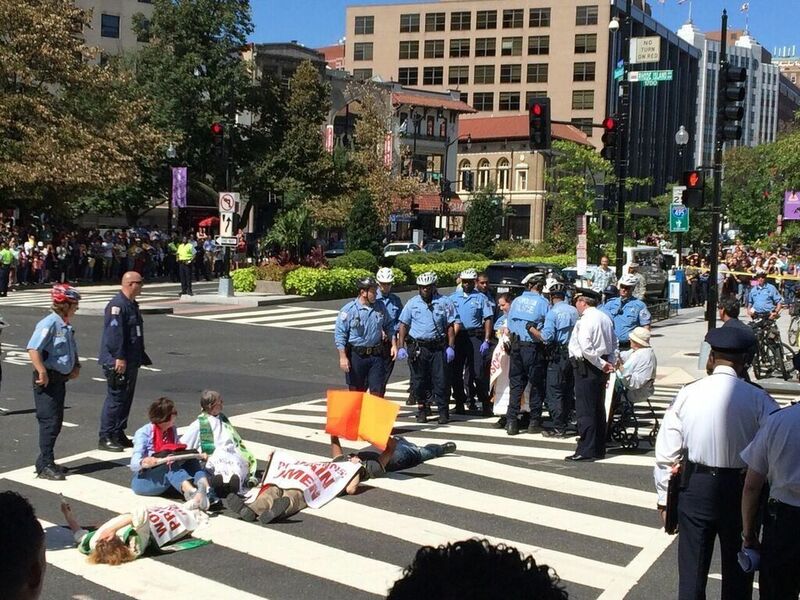 At around 11 a.m., police ordered those near the cathedral to get out of the crosswalk. “I think this could be the moment,” Bourgeois muttered, before lying in the street. His six companions then fell to the pavement. The group remained there for about 90 minutes — well after the pope’s arrival via another street — until police moved in to make arrests. Some were physically carried off the street. Police issued each of the protestors a $50 ticket for blocking the road. The protesters stood on the corner as Pope Francis departed the cathedral, his motorcade passing right by them. APOYO EL 100% EL SACERDOCIO FEMENINO. SOLO BASTA QUE UN SOLO DIA LAS MUJERES DE CUALQUIER CREDO NO VAYA A LA EUCARISTIA O A LOS CULTOS Y SE NOTARA EL VACIO. Gracias, Judy, por este resumen. Muy bien hecho! RCWP-ARCWP Unidas en un solo corazón y un solo Espiritu! Nos une el Evangelio, un mismo objetivo y por la unidad y la paz siempre adelante.